I have to confess that once I was a big fan of Tony Blair and somewhat credulously believed he was above mendacity or even obfuscation. I was a long time worried over Iraq until I came finally to judge the adventure a disaster. Despite the need to rid the world of Saddam there were practical politics questions which were criminally ignored. Even recently, afrer reading Rawnsley, Campbell, Mandelson and Blair himself, I wanted to believe he genuinely tried to achieve peace before resorting to war. 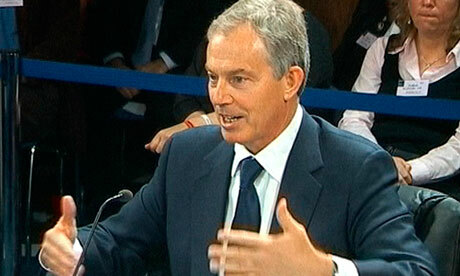 However all my excuses for Blair were blown away by the recent accounts of the two former secretaries to the Cabinet. These guys are the nerve centre of government decision-making and usually have a high respect for the truth. I was myself a civil servant long enough, moreover, to know how loyalty to elected ministers is bred deeply into the DNA of such folk. It must have taken quite a series of transgressions to elicit such sweeping condemnations. "None of those key [Whitehall] papers were presented to the cabinet so I do not accept the former prime minister's claim they knew the score ... That isn't borne out by what actually happened,"
Sir David Wilson, Turnbull's predecessor, said that if asked whether there were "proper cabinet" decisions in the run-up to war, he would say "emphatically not". "This cabinet allowed Mr Blair to be extremely strong. He was extremely strong in parliament, in public opinion, in the trade union movement, in the Labour party and in his cabinet – with the exception of Gordon Brown. There was a mismatch between what the prime minister's thinking was and how much he shared with his colleagues ... By summer  he had largely made up his mind when his colleagues were a long way behind... Discussions of military options were promised but did not happen."